The dark-brown bitter drink that perks you up in the morning comes from an Ethiopian cherry. In the wild, the tree grows to 50 feet in height, but commercial coffee growers keep their crops trimmed to 6 feet. Each cherry has two seeds, which are the beans that are washed, roasted and ground for coffee. Even though Florida doesn't have the high-altitude tropical climate coffee plants prefer, container-grown hybrid varieties sold at nurseries thrive in the state. 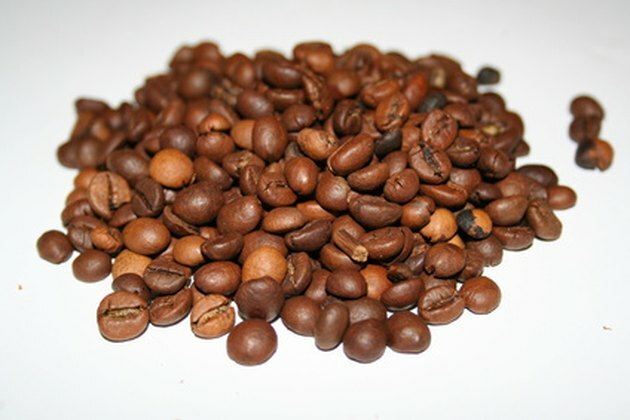 Coffee beans are the seeds of an Ethiopian cherry. Pick a nursery coffee sapling that's no taller than 4 feet. Bigger trees tend to be root bound, a condition marked by root systems that grow in circles around the insides of the pot. Root-bound plants don't develop well when transplanted. In addition, examine the leaves, stems and trunk to verify that the tree is free of pests. Irrigate your sapling when you get home and keep it moist until you transplant it. Select a planting site in the shade. Coffee trees grow well under large trees when planted about 8 feet from their base. If shade isn't available, they adapt to full sun. A south-facing location is also better than north, as coffee needs warmth. Break up the ground and mix it with manure, compost or other organic matter. Coffee trees also prefer acidic soil, but there's no need to amend yours if it has a high pH. As long as the site drains well, the tree adapts to the ground as it is. Rake the prepared area to an even surface. Dig a hole in Florida's sandy or rockland soil that's three times as wide and as deep as the tree's root ball. But if you live in one of the state's flood zones, make a 3-foot planting mound first. Then, dig a hole three times as wide and deep as your coffee tree's root ball. Add enough topsoil back to the bottom of the hole for the plant to sit slightly above the soil line when you plant it. Plant the coffee tree and back fill the hole with topsoil. Firm the ground around the trunk to remove air pockets. Water your new coffee tree deeply at planting. Keep the soil consistently moist until the tree blooms for the first time. At that point, begin to control the plant's development by reducing or increasing irrigation. In spring, water the coffee tree regularly to encourage wood growth and flower and fruit production. In winter, reduce the water to slow development. Apply ¼ pound of a complete fertilizer in dry form every other month in the growing season. A complete feeding formula contains nitrogen, phosphorous and potassium. When the tree begins to produce fruit, increase the amount to 1 pound. Always water the plant after you fertilize it. Spray the coffee foliage with a general foliar nutritional supplement divided into four applications through the growing season. Amend the soil four times in the growing season with a dry iron supplement if the coffee tree is in acidic or neutral pH soil. Improve alkaline soil by saturating it with liquid chelated iron. 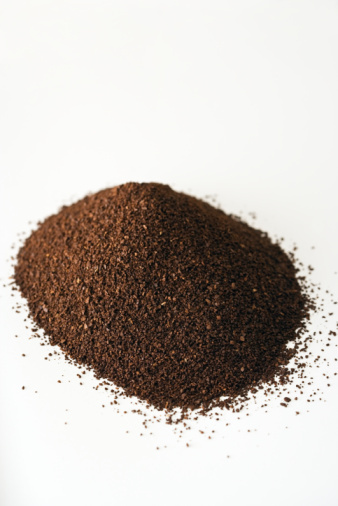 Make a 6-inch-thick ring of mulch around, but also 1 foot away from, the coffee tree. This mulch conserves moisture and chokes weeds. The University of Florida suggests using bark or wood chips. Get help from your local cooperative extension office if your coffee tree becomes infected with a disease or suffers an insect attack. The state's extension office says that fungus and a number of insects affect coffee trees. The office staff stays on top of the latest solutions for such problems and is well-prepared to advise you. Harvest the cherries by hand when they become red to process them for coffee. Or keep them on the tree if your plant is ornamental.